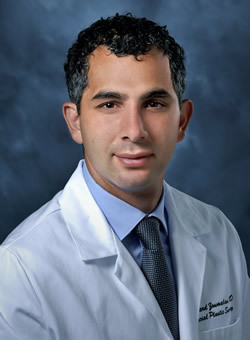 Dr. Richard A. Zoumalan, MD is a member of the Sinus Center at Cedars-Sinai. He is a facial plastic and reconstructive surgeon, board certified in otolaryngology-head and neck surgery. Dr. Zoumalan’s clinical focus is on rhinoplasty, revision rhinoplasty, aging face surgery and facial reconstruction after trauma and cancer. He has expertise in nasal procedures, which can help people breathe better. Dr. Richard A. Zoumalan has done extensive research in the field of facial plastic and reconstructive surgery. He has published over 40 research articles and book chapters and he has spoken at dozens of scientific medical conferences including otolaryngology meetings. He earned his medical degree at Northwestern University School of Medicine. He then completed a fellowship in facial plastic and reconstructive surgery at the University of Washington, sponsored by the American Academy of Facial Plastic and Reconstructive Surgery. Rhinoplasty, revision rhinoplasty, aging face surgery and facial reconstruction after trauma and cancer.